Well, it’s that time! What time is that, you ask? Time to give the ol’ blog a refresh! 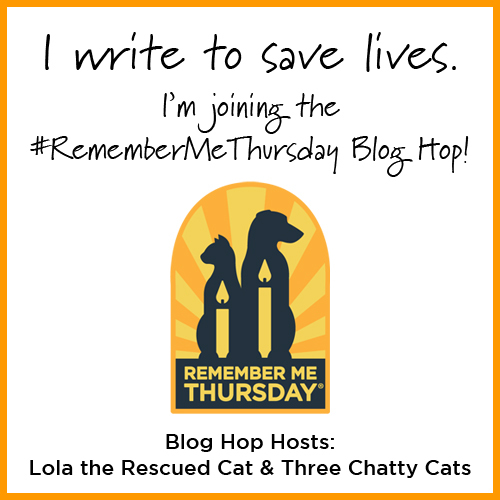 As readers know, I had three cats when I first started this blog – hence Three Chatty Cats. However, we’ve since adopted two cats, so we now have five cats in the house. 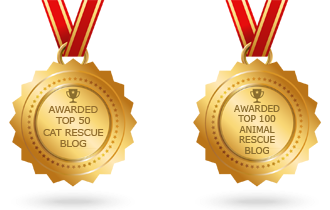 I decided it was finally time to give Woodrow and Harley their due on the blog. 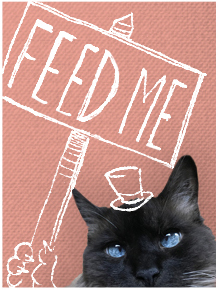 With the recent addition of the cats’ weekly chats on the blog, I wanted something fun and whimsical for the blog header – and the old black and white version just didn’t fit anymore. While it served its purpose for a while, it only showed the three original cats, and I was also getting tired of the B&W since it didn’t really match anything else on the blog. 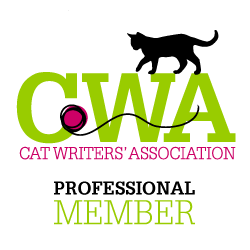 I’d like to introduce you to Three Chatty Cats and the Jr. Associates! More playful, right? I thought it would be fun to introduce the new look with this little one-minute video I made. Volume up to enjoy it! Dexter is our shyest cat by far. He’s the first to run and hide (and stay hidden for longer than necessary), but he also loves exploring anything new in the house. Just very, very slowly. Recently, he’s shown his passion for sci-fi and space adventures. 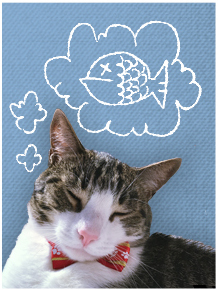 At heart, Dexter is a dreamer. Just a shy one. As any good tortie should be, Olive is the lady of the house and lets everyone know it. She’s our smallest cat, but don’t let her size fool you. She has the loudest roar in the house. You don’t mess with Olive. You just don’t do it. Olive is also quite the loner, often found lounging by herself in a sunpuddle. The only one she’ll let near her is Dexter. But at the end of the day, Olive is a sweetheart and loves belly rubs. On her terms, of course. Sophie is a beautiful cat. But more often than not, she has a goofy look on her face. And not only that, she’s actually doing something goofy. Whether it’s getting her head stuck in a Kleenex box or getting stuck between the sliding glass door and screen door, Sophie is our resident goofball. But she’s also quite mischievous. It’s easy to blame something on Sophie because most of the time, that would be accurate. She steals straws and hair ties, stalks and pounces on Olive, and just generally seeks out trouble. Oh, Woodrow. What can we say about Woodrow (our first foster fail)? He’s just so sweet and lovable, but he’s kind of a dum-dum. A lot of that has to do with his expression. He has a dazed look on his face much of the time. He looks lost or confused sometimes. Woodrow has the sweetest little meow that he chirps when Ross comes home from work. He loves sitting on our laps and being pet. Definitely lovable. Just a tad dim. Harley, our second foster fail, is the oldest cat in the house. And he fills that role well. He doesn’t meow – he grumbles. Like, seriously, he grumbles. He’ll be walking down the hall grumbling to himself. He comes into the bedroom in the morning and grumbles. He uses the litter box, then grumbles. The other thing about Harley – he comes running at mealtime, pounding down the stairs (he’s not light on his feet). He whaps anyone in his way and goes to the front of the line. Harley definitely subscribes to age before beauty. 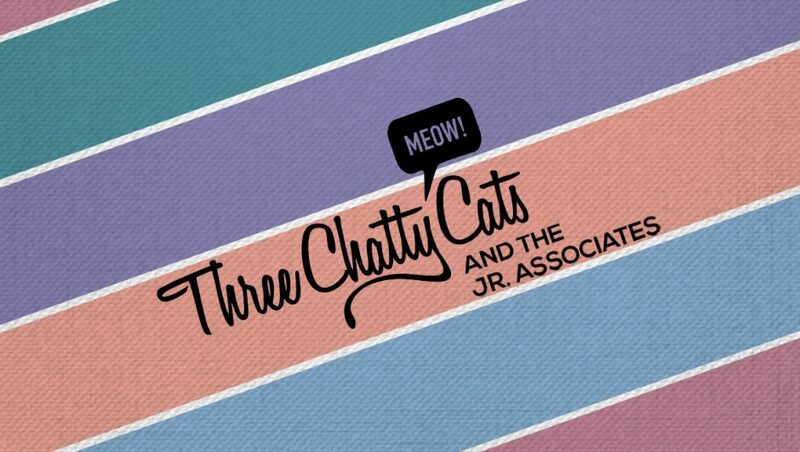 So, Three Chatty Cats has become Three Chatty Cats and the Jr. Associates. (Of course, Harley grumbled his displeasure at being a Jr. Associate.) We’ve added more colors to play around with, and I can’t wait to incorporate the new look and feel into upcoming posts! A ginormous thank you to my hubby Ross for creating the new header. Not only that, thank you to Ross for being an idea generator when I’m running on empty and for always proofing posts and making suggestions. 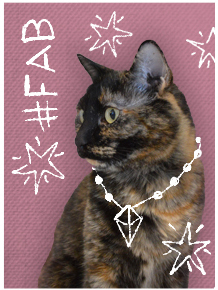 As Olive would say, you’re #fab. 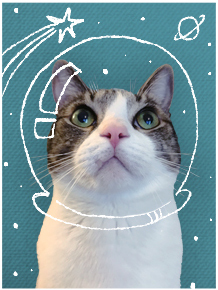 Previous Chatty Cats: Cuddles, Boops and More! 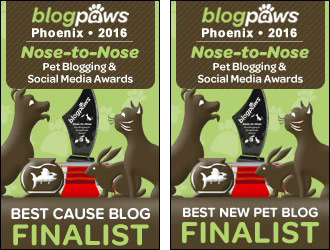 Next Chatty Cats: Catio, Gotcha and More! That is a wonderful video and a great explanation of all the cats. Well done. Love the pictures and the new header is just the best. Have a fine day. Thank you! Yeah, it’s a lot to keep straight. I only have five! Some bloggers have so many more than that! That’s a great idea! Harley doesn’t really swat cats that get in his way for dinner, does he? He does! :-) It’s just a gentle reminder to the youngsters that he should be fed first. No real fighting though. This is so great! Love the colors. Of course it is the tortie who is the rebel! 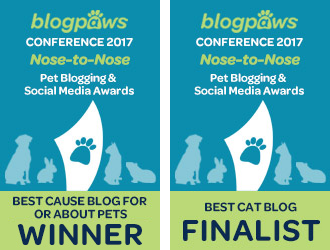 Oh we love the video AND the new header……..and of course we love ALL of the cats in spite of or because of their adorable purrrrsonalities. The thing about cats really is that they have DISTINCT personalities. 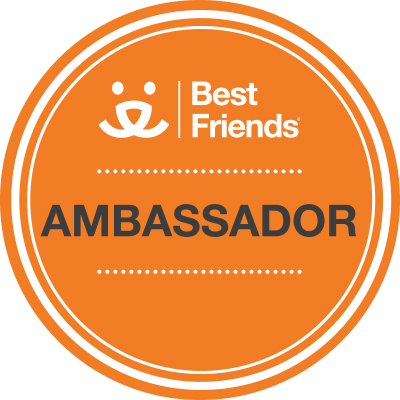 We love following their adventures and having you as our friends too! Thank you! I had fun with the video. And the hubby liked playing around with the header. Agreed, cats really do have their own distinct personalities!! All of our five are so different. Hugs to you and Teddy! Aww, thanks guys! I had a lot of fun with the moovee (getting back to my film school days!). I’ll pass along the compliments on the header to the hubby! Everything looks grr-eat! 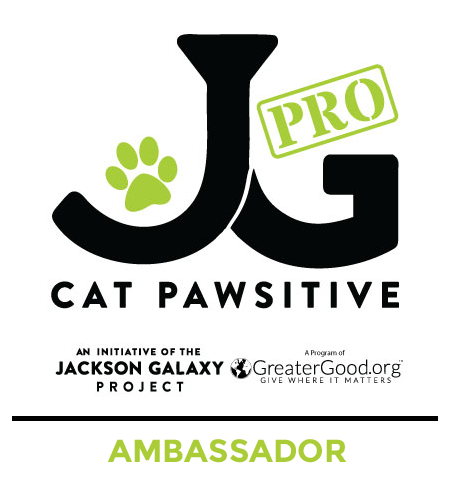 I love that you did a video, too, showcases your anipals! Hugs for Harley, Dexter, Sophie, Olive and Woodrow! I’m glad you liked the video! It was fun to make. I’ll pass along the compliments on the header to Ross! And you do😻🐾! Mr. Ross deserves a big hug for the Marvelous job! Thank you! And Olive loves what you said. She thinks that’s just perfect! We LOVE your new header! Can we borrow your cat daddy? Our’s is the first to admit he knows nothing about design but he does proofread—usually badly—the blog. Thanks, CK! Haha, I’m not sure how Olive would feel about lending out her daddy. Perhaps if you bribe her with treats. I’m so happy you stopped by! Glad you liked the video, too! It was fun to make. Just saw your gorgeous photo of Georgia, even if she didn’t think she looked good. I LOVE your new header. Ross is very talented. We love to hear that! Smiles are our goal! Oh my cat! I am loving this! The colours go so well with what you’re trying to express. Lighthearted fun with kitties. The video is just superb. I can see you had so much fun putting this together. I also only had 5 Cats initially and then hubby decided to adopt more! I’m also in the process of putting their profiles together in a meet the Chirpies section. Overall you and Ross have done a great job!! Thank you, Yas! Yes, I loved making the video. And I am truly lucky to have Ross as a secret weapon. You don’t need a secret weapon with all the talent you have!!! Your new look is fabulous and we sure enjoyed that video and officially meeting everyone! Thanks, Lexy and Lola! I’m glad you like it. Your mom just likes to focus on writing wonderful content, and she’s very talented at that! Raw chicken probably won’t cut it (he’s a vegetarian). :-) I sat on our blog refresh for too long. But I’m glad I finally did it! And I think your header looks great! Now that is a good looking group of associates! Love the photo backgrounds too! That was a great video and the header is really great! You’re husband is very talented. I liked getting to know your furbabies too. Thank you! I had fun making the video, and I’m really happy with how the header turned out. Lovely header. It really shows off their personalities. I’m sure the junior associates appreciate being officially included! I love all of your cats, and your descriptions of them are pawsome! The most cats I have had at one time is four, but I’d have more if I could. Aww, I love this! Your new header is super cute. :) As was the video; loved Sophie’s few seconds of showing how much of a goofball she is! This is fabulous! I LOVE the video, the colorful header, and the slight name adjustment! Your video is so fabulous, I love it! 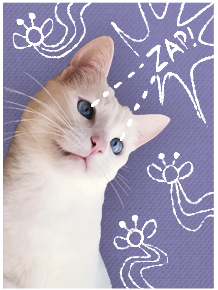 It perfectly portrays each of your cats’ personalities. I’m glad you’ve introduced us to all 5 of them, they are all special. OMC OMC OMC!! LOVE! LOVE! LOVE!!! May I borrow your husband please???!! He did a most pawesome job and that video is just ADORABLE!!! Love the colors in your header. Oh and if I were a kitty I would be Harley MOL!!!! Just fabulous! Love the new blog look! 💜💛💙💚💝 Great job on the video too! Jr. Associates made me snort, a little snort, but enjoyable nonetheless. This re-branding is pretty cute and you could keep extending the idea. I’m sure Harley looks forward to the day he makes full partner! I’m gonna comment about something what is my expertise; I absolutely love the way you implemented the great color scheme. I love the colors, how they work together and how you used them. I love the video! What a great way to introduce your beautiful kitties! So nice to *meet* them all! Really lovely design, too! They are a lovely bunch and really made me smile. I like the new look, it really lets the text speak with a dash of kitty sparkle. This is a great way to introduce all of the kitties. I love the colors you are using now and look forward to seeing them integrated into your posts. I love the new look!! And it was SO great to know a bit more about each kitty!